I joined the Army and became a prosecutor because I wanted to serve the public and enforce the values that make this country a great place to live. 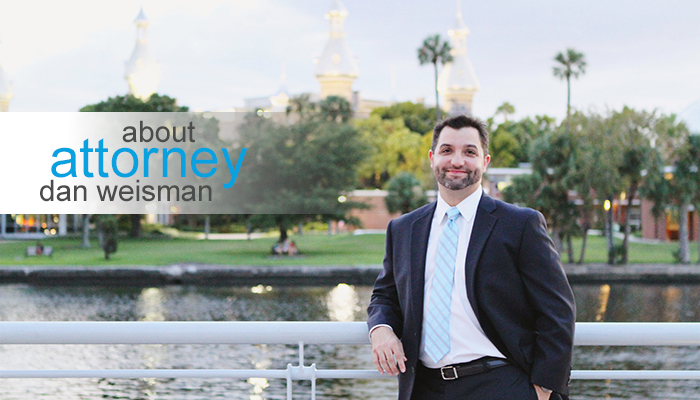 I founded the Weisman Law Firm to continue to serve our community and enforce the rights of individuals. Dan grew up in Gainesville, Florida, and attended Gainesville High School and then the University of Florida for his undergraduate studues. After graduating from the University of Florida, Dan volunteered for the Army and joined the Infantry. Dan completed some of the Army’s most rigorous training courses, including Ranger School, Officer Candidate School, Airborne School, and Jumpmaster School. In 2003, he had the privilege of leading soldiers from the 101st Airborne Division in Iraq. Following his service in the Army, Dan attended law school at the University of Florida with the goal of continuing his public service as a prosecutor. Upon graduation, he was hired as an Assistant Statewide Prosecutor for the Florida Attorney General. There he worked on fraud and embezzlement cases, as well as cases against drug trafficking organizations and theft rings. Dan dedicated a number of years exclusively to investigating and prosecuting violent street gangs. The Florida Gang Investigators’ Association named him Gang Prosecutor of the Year in 2011. As a prosecutor, Dan had multiple complex jury trials. For every major case that he developed, charged, and tried in court, the jury issued a verdict in the prosecution’s favor. Dan is admitted to practice in all Florida state courts and the U.S. District Courts for the Northern and Middle Districts of Florida. Dan lives in Gainesville with his wife and their two sons. He likes reading a good book and doing pretty much anything in the outdoors. For more information, please see Dan's LinkedIn profile. Copyright © 2019 Dan Weisman Law. Theme by Puro.